Gubernatorial candidate Lee Whitnum was arrested on breach of peace charges during a candidates’ debate at Brookfield High School Monday. Roseanne Colletti reports. 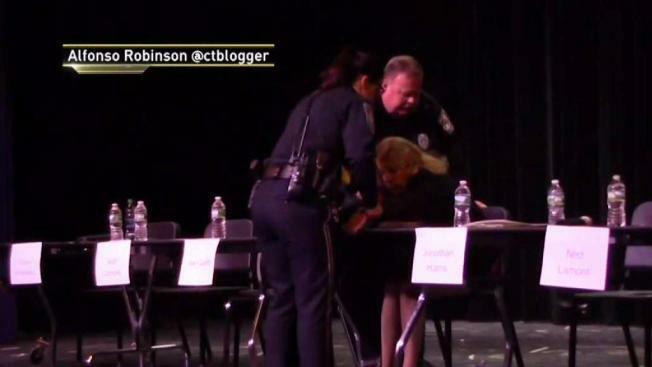 A Connecticut gubernatorial candidate was dragged off the stage by police at a debate Monday after she refused to leave the event. Candidate Lee Whitnum was arrested on breach of peace and trespassing charges during a candidates’ debate at Brookfield High School Monday. The event was a private forum put on by the Brookfield Democratic Town Committee and Whitnum was told she was not welcome. Whitnum showed up anyway and refused leave until she was forcibly removed by police. News 12 captured the exchange on camera. The footage shows the candidate first grabbing the table in an attempt to stay on the stage. Then she falls to the ground and goes limp after she is pulled off stage. "I had every right to be at that debate. I am a declared candidate for governor. My paperwork was filed more than a year ago. I told them I would be attending,” Whitnum said in a statement. On Tuesday, she said she had no regrets about the stunt, adding "I feel good about it." She was released on a $500 bond is scheduled to appear in court on April 19. Laura Orban, chair of the Brookfield Democratic Town Committee, did not comment on Whitnum's removal in a statement, but thanked police "for their prompt and professional handling of the situation." The Connecticut Democratic Party said Whitnum's behavior was "inappropriate. "Frankly it’s not the first time. There’s no place for that type of behavior in our party, and there is too much at stake this fall," the party said in a statement.